The Legend of Zelda: Breath of the Wild may be the first Zelda game where the not-so-green clad hero's mount can be any horse he chooses, but did you know that there are more options beyond that? In this guide we'll be taking a look at some of the rarer horses and mounts that this game has to offer. Sadly, not all of them are registerable at the stables, so they will be gone after you catch them. Nevertheless, some are rather neat, and worth checking out for the fact they exist at all. 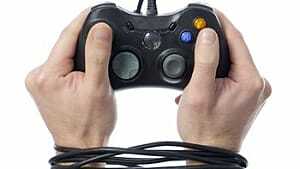 SPOILER ALERT: This guide reveals information about side quests, minor plot details, and more. Continue at your own risk! 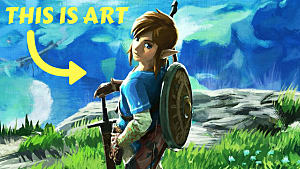 In several of Link's memories, Princess Zelda is seen riding a purely white horse. While 100 years has passed since those memories took place, it is still possible to find the descendant of that long forgotten era trotting about its ancestor's old stomping grounds. It is also one of the best -- if not most useful -- non-amiibo registrable steeds in the entire game. 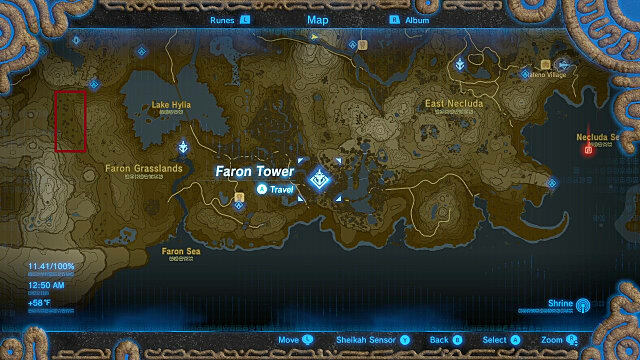 To begin, travel to the Outskirt Stable -- marked above in yellow -- which can be found just north of the Great Plateau. The stable can be found right along the road, so there is no need for you to detour while on your way there. Once you get to the Outskirt Stable you will find an old man who remembers stories of the Hyrule Royal Family riding upon magnificent white stallions. 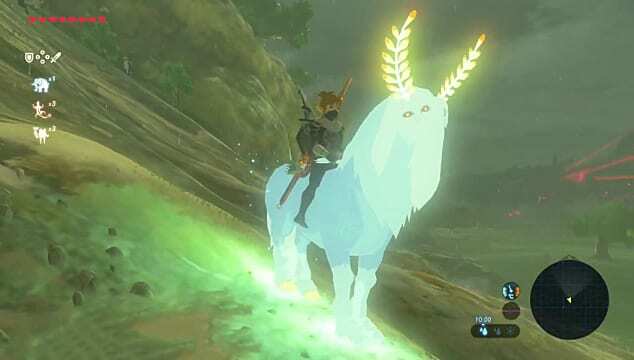 If you promise to bring him a similar horse, this will initiate a side quest in which you will search for the descendant of Princess Zelda's own steed. This side quest will have you venturing to Sanadin Park Ruins -- marked in red. Keep in mind that this location is also the place where one of the memories takes place, so if you want to hit both quests at the same time be sure to first visit Impa in Kakariko Village. When you reach Sanadin Park, you'll notice that a white horse with a blonde mane has now appeared. Be sure to stock up on stamina potions and recovery items before trying to catch this horse as it has a wild temperament, making it one of the harder horses to catch in the game. 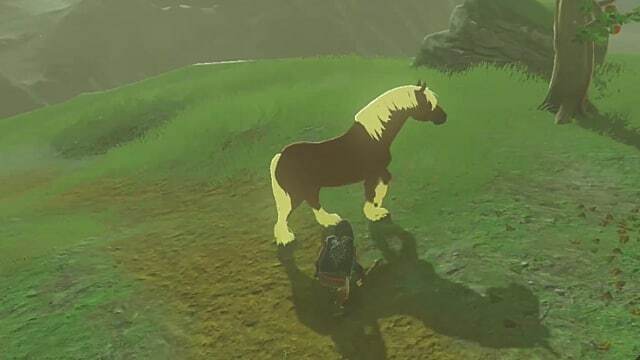 Without stamina upgrades or recovery, this horse will be near impossible to catch -- even with rapid button mashing as there is a maximum number of inputs you can do with a full unexpanded meter. Once you have calmed the horse, return to the Outskirt Stable to register the horse. This horse has some of the highest stats in the game, and is irreplaceable if it dies. That said, you can venture to the Horse God Great Fairy to revive it, provided you have already found it. Furthermore, if you talk to the old man afterwards to finish the quest, he will give you the royal saddle. The northwest section of the Faron Grasslands houses a big secret: a really big horse! 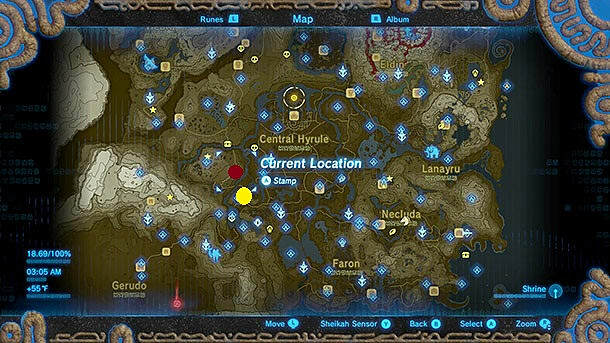 If you head to the area marked with the red outline, you will find yourself in an area with about five horses. Among them is a horse that is twice the size of the others with an orange mane, and black body. That horse is none other than the Giant Horse, and once you get it outfitted, it bears a striking resemblance to a certain Gerudo male's warhorse. 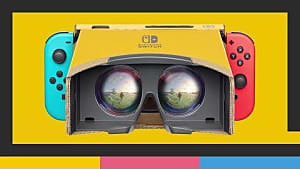 Taming this horse -- let alone catching it -- will require stamina boosts, and patience as the wild temperament and maxed strength rating will leave you in this horse's dust without at least one extra potion. The Giant Horse is a great addition to any rider's collection, but keep in mind it only has a speed rating of two, and cannot dash. That said, it does kill most smaller enemies on contact, so the trade off is there. Epona is the horse typically associated with Link, having originating in Ocarina of Time. Sadly, the only way to get Epona to appear is through an amiibo exclusive. In particular, you will need to scan the Super Smash Bros. series Link amiibo. 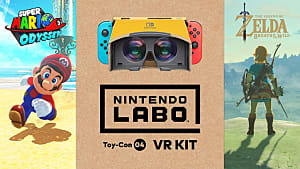 If you have the Link amiibo, simply activate the amiibo rune (amiibos must be enabled in the game options), and then tap the Link amiibo onto the right Joy-Con if you are playing on the Switch or the amiibo panel on the Wii U.
Epona is a great asset to your journey if you are able to get her. With 4 stars in all stats, and a gentle temperament, there isn't a single in-game horse that you can find that will match her ability. The downside, of course, is that if Epona dies -- that's it. 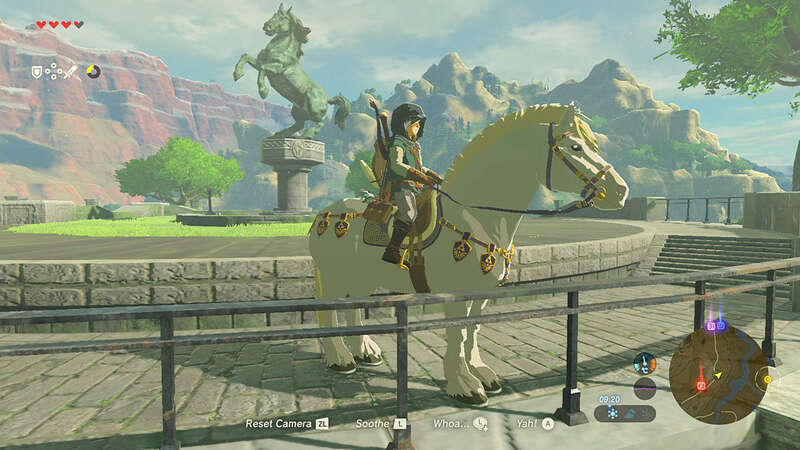 You cannot respawn Epona by tapping the amiibo again after she dies, and you will only be able to get her by restarting your game or by finding the Horse God's Great Fairy Fountain. 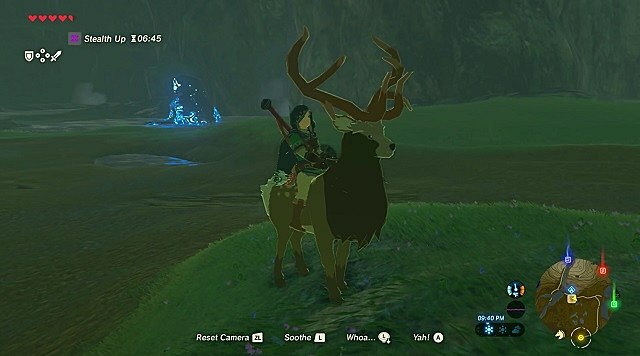 Bears, deer, oxen, and more can be ridden in Breath of the Wild. However, none of them are registerable at the stable since the network has a strict "horses only" policy. Fauna prejudices aside, this isn't a terrible loss since mounts aren't particularly useful as none of them really have any special abilities, and can't dash. As a result, they're more useful for simply getting back somewhere without wasting stamina as most of them run at Link's sprint speed. If you were a fan of Red Dead Redemption's Undead Nightmare expansion, you'll be a fan of this one. 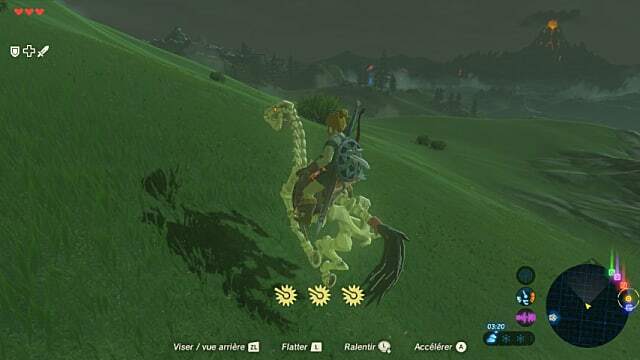 Up in the Akkala Highlands (northeast) -- and several other locations where bokoblin horse riders exist -- you can find Stalhorses ridden by undead Bokoblins at night. These mounts are fairly ineffective since they have some of the lowest stats in the game, but that doesn't quite matter since they die by sunrise, and you can't register them at a stable either. Nevertheless, it's a neat touch in a game full of neat touches. At the peak of Satori Mountain in the western part of Central Hyrule is a small pond with pink petals littered throughout. Perhaps you have found it before, but never quite knew what it was about. Well, if you come back to that same pond at night you can find a spiritual mount known as the Lord of the Mountain. The Lord of the Mountain is yet another unregistrable mount, which is quite a shame since it has some fairly high stats -- about the same as Epona if my in-game behind-the-scenes testing is anything to go by. For the time being, these are all the various mounts that Link can find in Breath of the Wild. 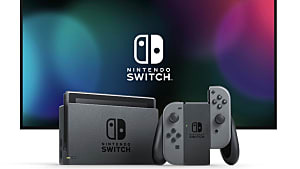 Be sure to check them out as some are required for side quests, even if you are only supposed to take a picture of them. 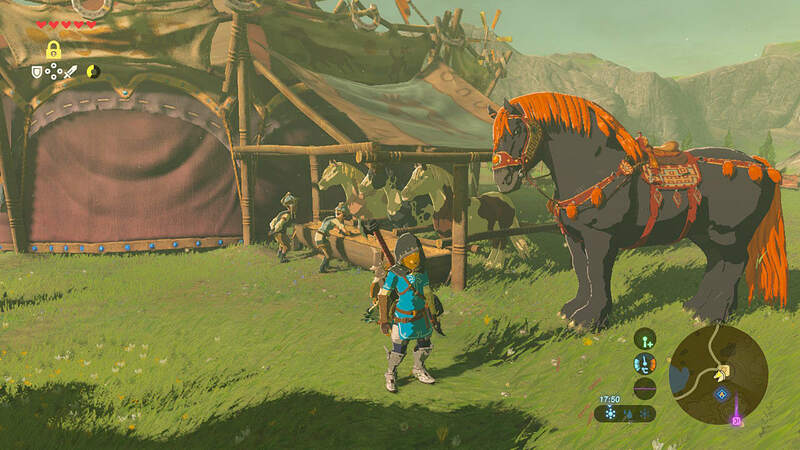 Also, if you're having a hard time catching horses -- or just starting out on your own adventure -- be sure to check out the Horse Taming Guide among the other guides below!